Dear poets and friends, today I lead you in haibun monday and I wanted to introduce a third element into the picture: the artwork. I always spend a lot of time trying to find artwork to my poetry. When doing this I have often found that when selecting the artwork it’s better to try to find artwork after I have written the poetry. For poetry the technique when combining art and poetry is called ekphrasis. My own theory regarding this is that the picture and poetry complement each other rather than that they are mere illustrations. This is much how the prose and haiku complements each other in a haibun. For haiku poets there exist a long tradition to let art and poetry complement each other in this manner called haiga, and if you study haiga you learn that complementarity between poetry and art is essential. This is not exactly ekphrasis as the art should be your own. 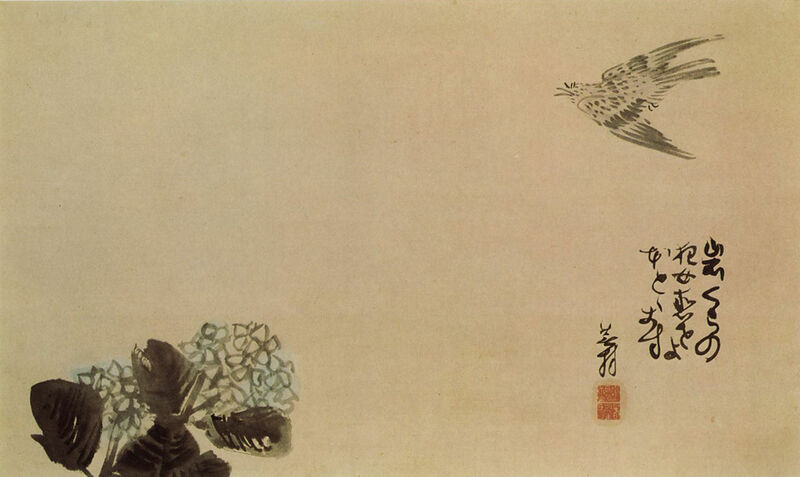 A little cuckoo across a hydrangea by Yosa Buson. My favourite site for artwork is wikiart, but sometimes I use photographs. Make sure that you follow the copyright rules when selecting illustrations. Today I would like you to write a haibun on any subject that you like. but you should illustrate it with one picture, and let picture prose and haiku complement each other. As usual I would like you to write the prose in first person and present tense. It should not be fiction (but I always think that fantasy and dreams can be incorporated). The haiku should contain an element of nature and season (I try to choose a kigo). I will not ostracize you for diverting a bit from the rules (I break them often myself). Remember that this is about having fun, and evolve your techniques in writing. I have always thought that I become a better writer by reading and commenting. When you have written your haibun on you blog you link up to Mr Linky. I would love you to leave a comment below. I love to write poetry in all forms and matters. Almost unpublished but busy writing poetry daily. Love to see the music and color in words and grab my poetic license with English. Happy Monday… great that subject is free… give me your artwork. And remember your own paintings, drawings and photos are more than welcome. Just remember to make them complement each other, not comment each other. Ekphrasis – I like how we can combined photos with haibun ~ I have seen a lot of haiga when I am reading haiku. I hope someone bring their own artwork… and yes I do remember some great haiga artists from the haiku circle. What a lovely prompt. I’ve chosen one of my favourite artists. I’ve never had a title with so many squiggly red lines under words before, either…! Ah.. great to have you Sarah… sometimes we just have to have a topic we choose freely..
Hi Bjorn! I have been a professional painter for 30 years, mostly landscape and birds. I pepper my blog with my paintings and have for 8 years, but few notice them. Now, as a poet, I can shift through and use them. This challenge is a good one, and one that should bear fruit here at dverse. My haibun I wrote last night, just in case there was a calling for haibun, and the painting? It might be a stretch, but this haibun is about the love and protection of my father towards me. He was a bird lover (an animal lover period bringing many strays home to nurse and adopt) and the message from me in this haibun is the fierceness of children when we have to be. And the love of a father who was struggling with his own demons. I’ll be over soon to read. Have gone vegan and it’s quite a challenge to cook…I am burning lentil soup right now! Later! You can’t go wrong with the Dutchman. Ha.. at least not if he has lost his ear. Bjorn, my son just reminded me you should never stand under a murmuration, because statistically there will always be a bird pooing. Just to bring us all down to earth. Ha.. we do have some big murders close to my workplace, and I guess that’s the same. Well, I’ve given this a go. Never done it before. Great to see you Jane… good that you try..
I’ll learn from reading everyone else’s. Evening all…time just whizzes by these nights but I am happy to be here and love the prompt. I take lots of photographs and use a few to illustrate poems…always the poem first then look for the image…I may go the other way tonight and find photo and try to write a Haibun for it. See y’all in the bar. I do the same as you…first the poem then the image… I think it gives the effect of complementing better. OK…So this evening I chose the picture and then wrote the Haibun…different experience for sure. I need my beauty-sleep and therefore I will go to bed now. Bjorn, i am up too late as well. But i had to try your challenge. Always a pleasure, grace. Not sure how well I managed the ekphrasis, but a very interesting challenge. I submitted one on watching the sunrise over water. I don’t know if I succeeded in getting those three parts to associate together without one illustrating the other. I chose a photo also. I assumed a photo was a kind of art, but maybe it should have been something different for this. After reading more carefully, I see that I did not meet the goals of the prompt. For that I apologize. I did however enjoy writing from this photo as I was waiting for the right moment to use it. Oh I may have to retry this one if I get time! Thanks for this prompt. Btw: tried commenting on your blog Bjorn and it disappeard – twice! I thought it great. I loved this, Bjorn! Thanks for bringing pictures into it. I think you’ll like what I came up with. I made the GIF years ago but wrote the haibun today. Have a nice week everyone! I’ll be around to read. Big hug! Having, not many minutes ago, been offered an invite by Victoria C. Slotto to participate in this community, I found the Mr Linky option had expired. So I take it pingbacks are my next option, the normal route? Confirmation of the latter or any appropriate advice will be thankfully accepted. Welcome Mick, every second Monday there’s a new prompt for haibun. But there are prompts also other days- check out the schedules. Thank you. I will check schedules out, but would I be correct in thinking that pingbacks are the method use to submit entries? Perhaps I am looking n the wrong place? Going in your direction now thank you. Oh, nearly forgot, can you or anyone you might confirm the Japanese script as correct o wrong, please.